Upgraded design. This new sleek design not only has a style that will fit right in on any desk, bedside table, or vanity area. 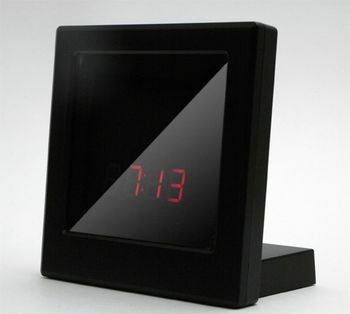 The mirror like finish also contains a fully functioning alarm clock. Not only is this unit sound and touch sensitive, allowing you to only have it display when you want to (this is changeable, of course), you can set up to 4 alarms with 8 tones. There are even physical button to operate the camera in case you lose the remote. High Quality video. Records 720 x 480 color video. Multiple settings. Use the remote control to choose between motion detection and continuous recording settings.